Ethpool was the first mining pool for mining Ethereum’s Ether coins, however it had some issues, was down for a while and then returned with a new concept – predictable solo mining pool. A predictable solo mining pool allows you to do pooled mining with a solo mining payment scheme, meaning that the miner who contributed the most work to the pool for each round will receive the full reward of the found block (or uncle) and his work account (credits) will be reset to his current credits minus the credits of the runner up miner. This simply means that depending on your available hashrate it may take more time to get your reward, but once you get it it will be a full block reward. Apparently the downtime and the new concept along with the low exchange rate for Ethereum’s Ether coins lately are not doing Ethpool much good, but they have not stopped working on new things. The latest addition is stratum support instead of the getwork that is typically used by the regular ethminer software. The introduction of stratum support requires users to use a special fork of ethminer that is called qtminer (source) that has been developed by Ethpool and is ONLY supported by their mining pool for the moment. A while ago another pool – Dwarfpool, has introduced a Stratum proxy as we’ve mentioned earlier on the blog, but their proxy implementation is not as good as actually having a dedicated stratum protocol supported by the miner itself. 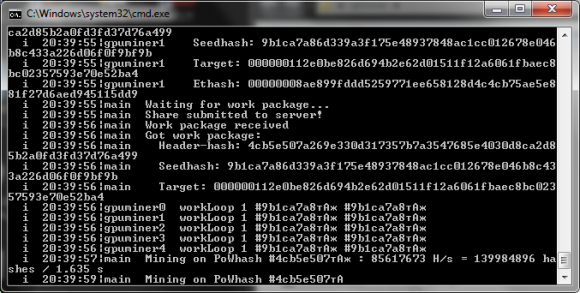 The command line of qtminer is very similar to that of Ethminer, you can check the HELP.txt file included in the Windows binary available for download below for the supported commands. As with ethminer, qtminer supports OpenCL mining on both AMD and Nvidia GPUs, there is no CUDA support available for Nvidia for the moment, and you should not be getting much different performance in terms of hashrate between ethminer and qtminer (AMD video cards still perform better than Nvidia ones). The actual difference is in the protocol used to get shares and submit them which should result in improved performance when you are using stratum instead of getwork due to better efficiency of the stratum communication protocol. Do note that you can still use Ethpool with ethminer and the getwork protocol if you are not satisfied with the results you get from the new qtminer with stratum support. The new qtminer stratum pool supports vardiff, so the difficulty will be automatically adjusted by the pool itself based on the hashrate you submit thus taking the guesswork and the need to find the optimal difficulty yourself. The result should be more efficient getting of new work and submitting of solved shares using constant stratum connection to the server and thus more mined coins for the same period of time as compared to using ethminer with getwork polling the server all the time. Looking at the logs of the qtminer and testing briefly the new stratum miner is showing that it works better than ethminer, make sure you allow a bit of time to get a good estimate on the current hashrate reported by the pool and estimated earning before drawing any conclusions. You should definitely give qtminer a try if you are currently mining for Ethereum’s (ETH) Ether coins on a pool with the traditional etminer, you might be pleasantly surprised by the improvement.